What were the memorable stories from 2015 among Maricopa youth? In the upcoming year, the Maricopa Unified School District will move up to the 5A Conference for athletics, there will be two votes to help solve the district’s funding issues and hundreds of seniors will graduate and take the next step in their lives. 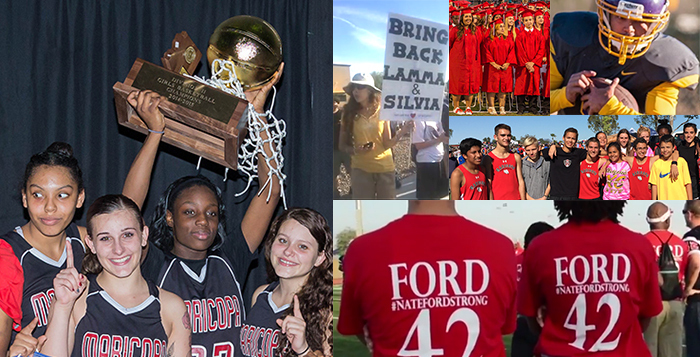 However, before Maricopa’s youth move into the future, it’s time to reflect on the year that was. The Arizona Department of Education debuted a new state testing system for the 2014-15 school year. The test was seen as an improvement on previous state testing, but the criterion was also expected to be much more rigorous. That proved out in the scores, where MUSD was disappointed in the outcome and even Legacy Traditional School, which outstripped the state and national averages, had room for improvement. The Maricopa High School Cross Country team qualified both the boys’ and girls’ cross country teams for the Arizona Interscholastic Association Division II State Cross Country Meet. This was the first time since 2011 any Maricopa team had qualified. The 346 seniors who received their diplomas in May were part of the largest graduating class in MHS history. The group also earned over $2 million in scholarships to college, and had 20 members earn a place in the National Honor Society. On Sept. 23, MHS received an anonymous call threatening to “blow this thing up.” From there, the school was evacuated and police searched the school for any contraband. The threat was determined to lack any “substance,” but the saga left its mark on the community. The story was picked up by local, state and national news services. For the first time in school history, Maricopa High School hosted a VEX VRC Robotics competition on Dec. 12. Twenty teams from around the state arrived at MHS to compete in the “Nothing but net” state qualifying event. Teams had spent the previous three months developing robots specifically meant to accurately shoot a ball into a net. The competition’s winners were able to earn a spot in the state competition at the end of the year. According to MHS librarian Robin Shoup, the school hopes to hold middle school and elementary school state qualifying competitions next year. It was a banner year for the Pumas of Sequoia Pathways Academy. First, the girls’ basketball team won the 2015 Canyon Athletic Association Division II State Championship, and then the football made a run to the championship game for the second straight year. The football team went 9-1 in the regular season before the championship game. The Pumas lost 28-22 to Heritage Academy in Mesa in the finals, but head coach Demond Williams was named Coach of the Year. The 2015 Homecoming festivities honored the past and present as current students and alumni came together to celebrate the last 60 years of Maricopa High School. Homecoming week featured community celebrations ranging from an alumni football game to a “Student vs. Teacher” mud run at Copper Sky Regional Park. The week culminated in the “Ram Fest 2015,” and the festivities were covered by local and state media sources. On Sept. 29, parents and community members were angry and confused when students were out of classes at Sequoia Pathways in the middle of the day. News spread fast across campus that two popular administrators, Nate Lamma and Diane Silvia, had resigned. A replacement principal was on campus only a day. Students staged a protest, and parents demanded answers from the academy’s remaining administration. To resolve the issue, EdKey Inc. Assistant Superintendent Tamara Becker took over the role of interim principal for the school. Lamma and Silvia were re-hired, a new interim superintendent was announced, and EdKey’s board re-evaluated its personnel policies. The Maricopa community was shocked and heartbroken when high school senior Nate Ford passed away in a car accident in late August. Ford was on the MHS football and baseball teams and was also involved in many aspects of the community. His death became a rallying cry for seatbelt awareness from the Maricopa Police Department, a source of motivation for his football team, and inspired the creation of the “Mothers of Everyday Heroes” organization as part of the Rocking 4D Foundation. Despite losing just five games all season, the MHS girls’ basketball team entered the Arizona Interscholastic Association Division II State Tournament as only the 12 seed. The Rams went on a “Cinderella” run through the playoffs and captured the school’s first girls’ basketball title in school history. The team was honored throughout the city and across the state, and first year head coach Kati Burrows was awarded “Coach of the Year” awards. The accolades earned Burrows a job as assistant coach for her alma mater Montana State University. MHS girls’ basketball assistant coach Melvin Mitchell took over the head coach position for the 2015-16 season, and the team has begun their title defense under his tutelage.